Metal Spray is a process by which metal (wire, rod or powder) is melted and the molten metal is sprayed onto a “target”. I have a 2 wire, Bridgeport sprayer made by TMS (The Metalizing Source) in Silverdale Wa. It has a Miller power supply and from there it is rather “parts put together to make it all work” machine. There are 2 MIG wire feeds in the “feed box” where each wire is charged (one negative and one positive) and pushed through a silicon plastic tube inside the hoses thru which compressed air is supplied to the “wire applicator” portion of the machine. The wire is at the rear of the “feed box” and each wire (there are 2) is fed into the wire drives and pushed/driven to the “applicator” end. When the trigger is pulled, the wire feeds, the air and the power are all turned on and the wire extends out the tips, meet each other and melt . The molten metal is then “blown” towards the “target” by 3 air nozzles (one on each side of and one behind the two wire feed tips) by nearly 100 cfm of air. When metalizing, it looks like one is spray painting but there is a lot of noise from the air and a lot of light from the arc. I use 1/16th” or 1/8th” wire, depending on what metal I am spraying. 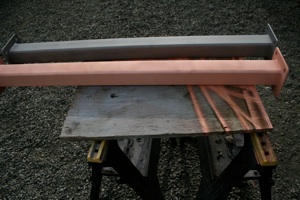 I can apply about 100 pounds of zinc per hour using 2 - 1/8” wires or about 1/3 that weight of 1/16th” copper, bronze, etc. per hour. With these higher melting temperature alloys, I drop down to 1/16” wires (if things come up, I could buy the feed rollers, tips, silicon tubing, etc. and use 3/32” wire to get a bit higher metal deposition than with the 1/16” wires). Most any metal in wire form can be sprayed, some however, may need special atmospheres and gases to keep them “clean” (titanium is one such metal). We bought the machine to apply metals to some of Cynthia’s mixed media works . We can apply metal to most any material including plastics, paper, cloth, paper mache’, paper clay, wood, cement, fiberglass, most rock, other metals, etc. When I go to antique auto meets, I apply zinc and/or bronze to the back of my paper business cards. The applied metal (no matter what alloy or metal) is a deposit of small “globs” of mashed and stuck together metal particles. 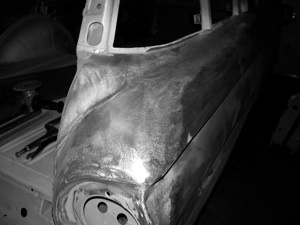 The applied metal can be sanded and if wished/needed polished. The applied material IS slightly porous as it is made up of a bunch of small, once molten, “globules” of metal particles. 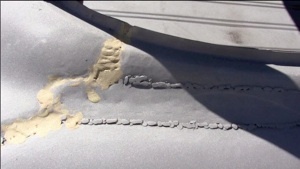 The sprayed surface needs to have some sort of “tooth” for these metal “globes” to stick to, so most surfaces are sand blasted with a sharp sand or other media to give the “target” surface a profile for the sprayed metal to stick to. The applied metal, no matter what alloy, is NOT structural, and bending or other movement of the “mother material” will cause the applied metal to pop off or crack, so there are limiting factors involving this process, but oh......... what a process it is!!!!!!!! See the pictures/movies of the “machine” and some “process” applications as well as finished pieces to the right. Let me know if you are interested in having something metalized or to discuss any applications you are thinking about. Email (john@MLCE.net) or phone (360.681.4240) are fine. A short video of the wire feed and hoses. Filling in a weld on a restoration job. Initial area to be filled. Filled area after being rough sanded. 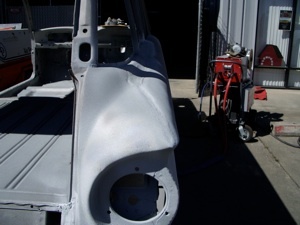 Another welded area that was filled and worked back to smooth. Steel supports customer wanted to look like copper.